This is a piece written by a volunteer from Hearts and Horses. The news is devastating. Nobody understands his agony because nobody knows how much he loves that grey horse with soft brown eyes. He had the privilege of caring for her and riding her the last couple of months and came to think of her as his. Now he would likely never see her again. In his heart he knows it’s right for her to be with her real family, but somehow he always thought she would be there for him. He puts his head on the table and goes still, trying to stop the pain that’s washing over him. Today he’s back at the riding center, and everyone is enthusiastically trying to get him to accept a new horse. There is not a chance that’s going to happen. Glory is the only horse for him, and it’s evident he is not interested in giving Fritz a chance. His is head is down from the moment he arrives, and he is completely disengaged from the excitement going on all around him. His heart is bound up tight, safe and sound. He is introduced to Fritz, another lovely grey mare with a soft eye. He never lifts his head or turns from the wall. He completely rejects this new horse companion without ever touching her or looking at her. He won’t even come inside the arena where the action is happening. He may as well be a thousand miles away. Fritz’s handler takes her outside the arena and parks her about two feet from him. She stands patiently for a good 20 minutes or more being completely ignored. The rest of us go about our business inside the arena while sneaking furtive glances at that corner. Everyone is silently praying for a sign from him, something, anything, but the minutes drag on with no acknowledgment whatsoever. Suddenly, Fritz starts nuzzling the back of his neck, the only part of him available to her as he is turned away staring at the dirt floor. She’s nodding her head up and down while her lips gently and repeatedly brush over his neck and up into his hair. That’s when time stood still. What would happen next? Would he brush her off? Would he and his broken heart walk away? Could he resist such a loving gesture and invitation from this beautiful creature? Ever so slowly, he turns away from the wall and faces Fritz. His eyes travel up to meet hers for the first time. Arms that a moment before seemed bonded to his sides unhurriedly moved up her neck to meet at the top for a huge embrace. His head rests on the side of her neck in total surrender to her offer of friendship. There is a collective release of breath we didn’t realize we were holding, and tears start to flow. How could that little mare know exactly what this hurting boy needed at the exact moment he needed it? We just witnessed a miracle performed by a horse. Some see only the therapeutic aspect; I see God in horse hair. “Suddenly, Fritz starts nuzzling the back of his neck, the only part of him available to her as he is turned away staring at the dirt floor. She’s nodding her head up and down while her lips gently and repeatedly brush over his neck and up into his hair. That’s when time stood still. What would happen next? Would he brush her off? Would he and his broken heart walk away? Could he resist such a loving gesture and invitation from this beautiful creature? Ever so slowly, he turns away from the wall and faces Fritz. His eyetravel up to meet hers for the first time. Arms that a moment before seemed bonded to his sides unhurriedly moved up her neck to meet at the top for a huge embrace. His head rests on the side of her neck in total surrender to her offer of friendship.” This is an excerpt from “Time Stood Still,” an essay which details the events when a grieving student has said goodbye to his “Changing Leads” horse and is introduced to Fritz, the new horse. This piece was written by a volunteer from Hearts and Horses. 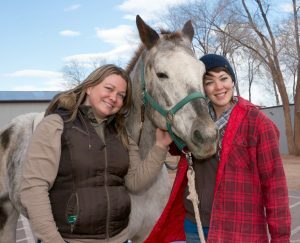 One of our newest grant recipients, Hearts and Horses, has developed a unique equine therapy program called “Changing Leads,” designed specifically for at-risk youth. Recently, we had the opportunity to speak with some of Hearts and Horses amazing staff including, Executive Director, Jan Pollema, Director of Special Programs, Tamara Merritt and Path Intl. Instructor and Equine Specialist, Hannah Perkins-Smith. Through them we learned so much more about this life-changing program! “Changing Leads” began in 2009 after Tamara met with several local youth agencies in Loveland, Colorado, in order to discover which youth needs remained underserved. All of the agencies said something other than traditional therapy would greatly enhance the youth’s ability to grow. Several elements of the “Changing Leads” program offer something different than traditional therapy. Horses mirror the emotions of their human counterparts, and interacting with horses allows young people a safe environment where they feel free from judgment. The students have eight weeks with the horses, and then they graduate, whereupon the students receive a poster of photos with their horses. 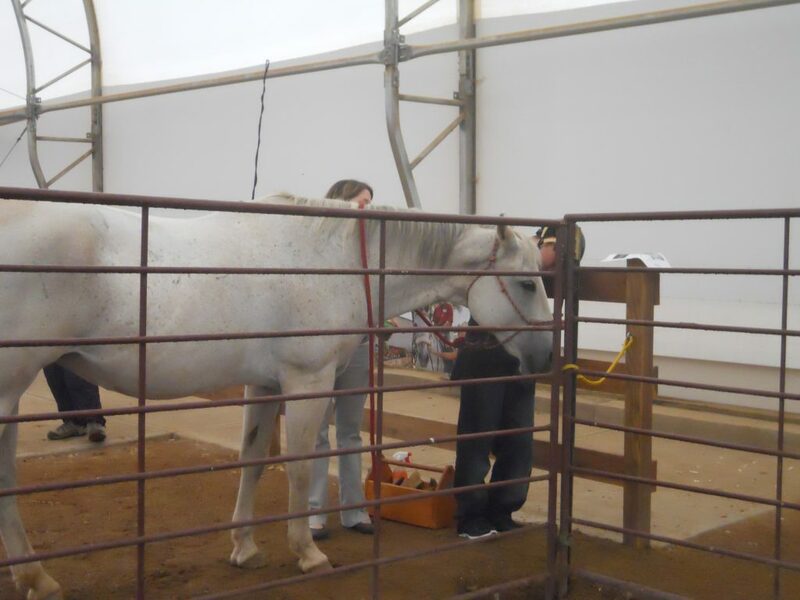 The students are matched with horses who have similar traits as they do. In doing so, students understand their own behaviors and how to ease anxiety. 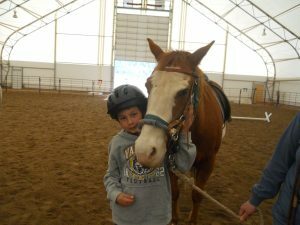 As the student bonds with the horse, mutual trust is built and self-confidence is bolstered. The horses are chosen after a lengthy period of observing and developing an understanding of the horse’s temperament. This process involves a 60-90 day trial during which staff members at Hearts and Horses assess each horse’s ability to be handled by multitude of different people with different personalities. Following this introductory period, staff members work to carefully match horses with students based on the horse’s personality and the student’s needs. Currently, Hearts and Horses has 24 horses with each horse going on approximately 8-10 rides a week. A key element of the “Changing Leads” program’s success is also the group of human volunteers. The bond developed between the students and volunteers is another aspect of the program which sets it apart from traditional therapy. According to Jan, about 90% of Hearts and Horses staff are volunteers, and their orientation process is just as thorough as that of the horses. Each training session consists of approximately 25 volunteers who receive a tour of the facility and horse arena, learn about the various support opportunities which exist, and train to either be side walkers or horse leaders. Side walkers are volunteers who have minimal experience with horses but can develop a relationship with both the student and horse as they support the youth during the rides. Side walkers ease any anxiety a youth may have during rides. Horse leaders guide the horses in the arena and they undergo additional training for this job. While “Changing Leads” has seen much success during its four years of guiding youth, the program does have its limitations. According to Tamara, who designed and implemented the program, expanding “Changings Leads” and its impact has been difficult. Not only has it been difficult to find appropriate staff to lead the program, but securing the funding to support staff and care for the horses has also been extremely difficult. Luckily, with Hannah’s help, Tamara has been able to more seamlessly facilitate and grow the program. Currently, 90% of “Changing Leads” participants are on scholarship. We learned that many of these students have missed riding sessions, in part due to transportation issues and their parents’ work schedules. In fact, many times the volunteers have made it a point to carpool students to the classes in order to ensure their attendance. “Changing Leads” is that important. Both Tamara and Hannah would like to see this program expanded to encompass an entire school semester. In doing so, the youth would experience more time with the horses and the riding lessons could be better integrated with their school curriculum. Additionally, extending the programing to encompass and entire semester would enable staff to more appropriately evaluate and measure the program’s effectiveness and long-term benefits. The Foundation for Global Sports Development is delighted to be supporting this program, which uses innovation and empathic animals to change the lives of youth. “Changing Leads” is currently making enormous positive changes, and we look forward to seeing them reach their goals of expansion. On Veterans Day, we want to take the opportunity to give thanks to our nation’s true heroes – the men and women who selflessly dedicate their lives to service in the armed forces. These veterans sacrifice so much and portray the true meaning of bravery and courage. At Global Sports Development, one of our primary outreach initiatives is supporting organizations and programs that help further the reach of our own mission and values. This year, we were excited to learn of and offer our support to Hearts & Horses, an inspirational therapeutic riding center located in Loveland, Colorado. Hearts & Horses uses equine therapy programs to fulfill their mission of promoting the physical, cognitive, emotional and social well-being of people with special needs. What really impressed us was the array of dynamic programming offered through Hearts & Horses, which further confirmed the organization’s passion for and dedication to helping those individuals who need it most. On Veterans Day, we are excited to spotlight their Hearts and Horses for Heroes Program. This program, in existence since 2008, is designed to help veterans heal and grow by restoring the wisdom of their mind, body and spirit through their interactions with horses, each other, and the natural world. Our goal is to help them transform pain into hope so that they can regain roles as productive members of society. A soldier’s journey is not over when the veteran comes home. The invisible wounds of trauma demand that veterans launch a whole new battle as they return to civilian life. This conflict can be as deadly as combat and also have devastating effects on a societal level. The statistic that one veteran kills himself every 65 minutes bears this out. At Hearts and Horses for Heroes, they have developed ways to not only contain the spread of trauma, but to transform it into post traumatic growth. “When I started at Hearts and Horses over a year ago, I already loved to ride and hoped that I would bond with the horse I was paired with. What came as a surprise was how much I would grow from riding with fellow veterans. In an attempt to distance myself from who I had to be in combat, I had avoided spending time with veterans for several years. The Horses for Heroes Program helped to remind me that I am not alone, and when I unite with my fellow sisters and brothers in arms, we are unstoppable”. Hearts and Horses for Heroes from Karen Fournier on Vimeo.